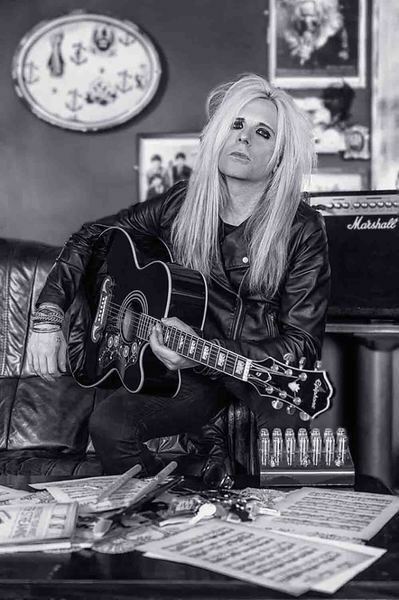 Midnite City was formed in January 2017 by current Tigertailz frontman (and former Vega, Steevi Jaimz and Teenage Casket Company member and songwriter) Rob Wylde. Armed with an album's worth of material written under the working title of Midnite City, Wylde approached friend Pete Newdeck (Newman, Eden's Curse, Blood Red Saints) to produce three songs for him to shop to record labels. Wylde sang, played guitar and bass on the recordings whilst Newdeck played drums, provided backing vocals and took care of the production. Wylde also brought in newcomer guitarist Miles Meakin who played guitar solos on the recordings and former bandmate James Martin (Vega) who laid down keyboards on the tracks. After being mixed by Newdeck, the songs were sent to Harry Hess (Harem Scarem) who mastered them at his studio in Canada. 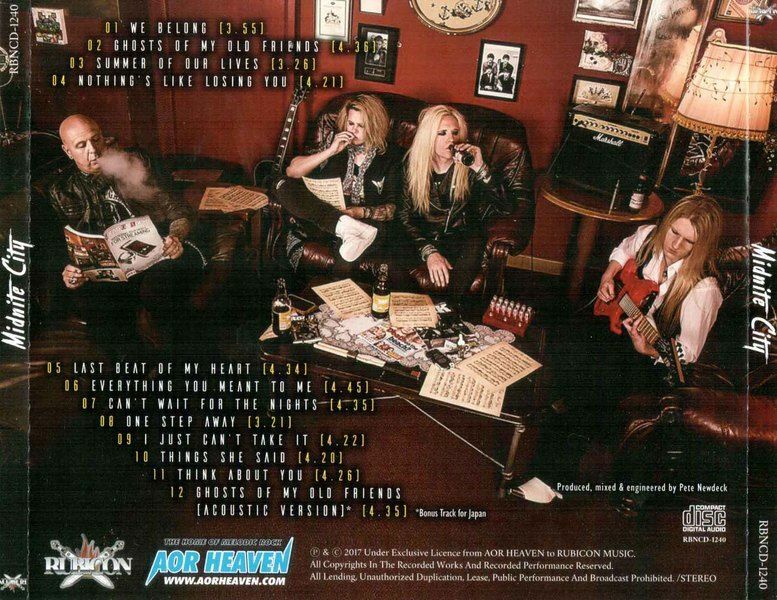 The songs "Nothing's Like Losing You", "Summer Of Our Lives" and "Think About You" were then sent out to labels and garnered considerable interest across the board, resulting in a deal being inked with German label AOR Heaven. With a record deal in place, Newdeck officially joined the band as drummer in the spring of 2017, alongside Miles Meakin on guitar and Shawn Charvette on keyboards. With the line-up now in place, the band began work on their debut album at PNP Productions in Tewkesbury UK, completing the recordings in June 2017. 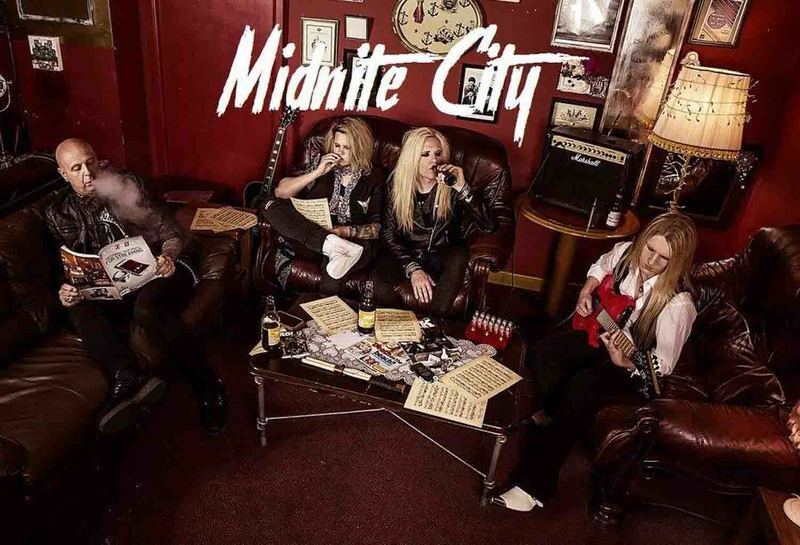 With a sound that the band describes as timeless melodic rock / hair metal, Midnite City covers all bases when it comes to this much loved genre of music. From ultimate feel good, party rock anthems, to brooding melodic rock monsters, to spine tingling power ballads, they are all here in abundance and then some. Wow, this album is truly amazing!Since the return of Hard/Glam Metal after a long hiatus, those same old and good musical genres that were great successes in USA (especially in California) moved to Europe. That catchy melodic feeling from old days came back, as the English quintet MIDNITE CITY is here to state with their first album, “Midnite City”. It’s amazing that a band that has no more than one year of existence could reach such level of quality. But as we take a deeper look at the bands members, we will see that they took part in acts as TIGERTAILZ, VEGA, STEEVI JAIMZ and TEENAGE CASKET COMPANY, BLOOD RED SAINTS and others. So we can say that they have experience enough to do so.On this album, you’ll find the same and good Glam Metal/AOR from the 80s, with charming melodies and excellent sticky choruses. It’s clear that the band shows a great amount of vicious energy with fine musical arrangements. It’s like we could have a band with the same elements as BON JOVI or DANGER DANGER on their earlier albums, but it is not a copy. It’s alive, charming and dangerous! Produced and mixed by Pete Newdeck (the band’s drummer), and the mastering was done on Canada by Harry Hess in his studio, the result is that sound quality of “Midnite City” is really excellent. To sound as clear as it sounds, but with the needed level of weight, is great achievement. All is clear, all is heavy, and all is excellent, just like that.The album’s songs are all excellent, and as I said above: it’s really amazing to hear such maturity on a band’s first album. To my nephews and nieces, I truly recommend you to pay attention to the heavy weight of “We Belong” with its excellent chorus and backing vocals, the melodic guitars and catchy melodies of “Ghost of My Old Friends”, the extremely accessible “Summer of Our Lives” (very good bass guitar and drums’ presence), the elegant ballad “Everything You Meant to Me”, the typical Pop AOR/Glam song “Can’t Wait for the Nights” with its very good vocals and guitars, and the fine Glam melodies that flows from “One Step Away”. 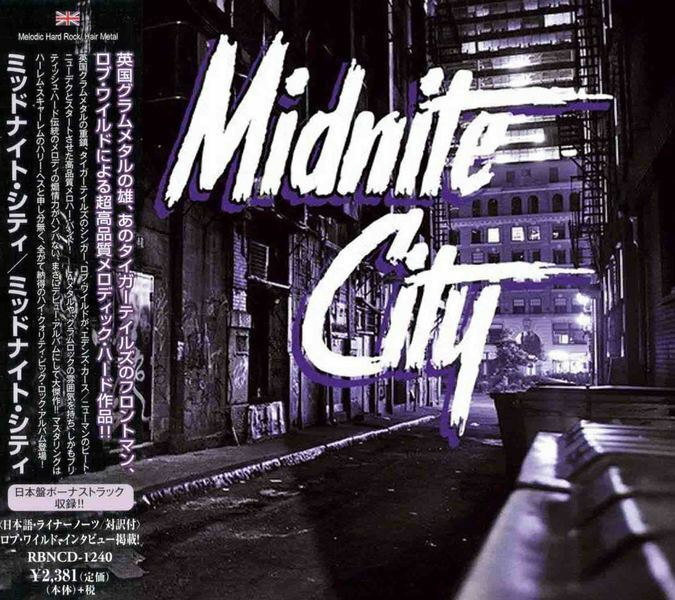 Here I wrote about 50% of the songs, but I recommend you to hear and be hooked by all the songs.Excellent work, guys, and hope MIDNITE CITY won’t be a band with only one album, because the more you hear “Midnite City”, the more of the band you want to hear.